This set has been specifically designed to support quilters who use quilting frames with the 1600P series. The set consists of a 1/4" ruler foot and an open-toe frame quilting foot. The 1/4" ruler foot has a high 'heel' and 1/2" diameter for freemotion quilting with 1/4" thick quilt rulers and long arm quilting templates. The open-toe foot has an opening that faces sideways to provide a clear view of your work when standing at the handles of a quilt frame. PLEASE NOTE - This set can only be used with the Convertible Free-Motion Quilting Foot Set (767433004). 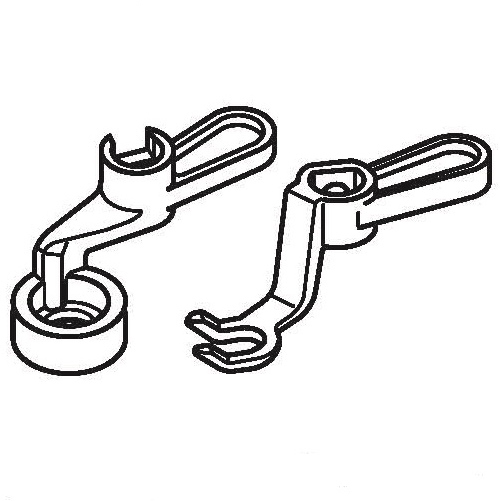 This set must be purchased to obtain ankle for attaching set to machine.